INDEPENDIENTEMENTE DE LAS CONDICIONES METEOROLÓGICAS, SIEMPRE NOS GUSTA PASAR MÁS TIEMPO EN EL EXTERIOR. NUESTROS JARDINES Y TERRAZAS SE HAN CONVERTIDO EN UNA PARTE INTEGRAL DE LA VIVIENDA, CON NUESTRA TERRAZA Y NUESTRA CASA UNIÉNDOSE EN UN CONJUNTO. RESULTA QUE CADA VEZ MÁS DESEAMOS TENER MAYOR CONFORT, AMBIENTE Y MÁXIMO PLACER EN EL EXTERIOR. PERO HAY QUE TENER EN CUENTA LA NATURALEZA TAMBIÉN, CON EL SOL, LA LLUVIA, EL VIENTO Y EL FRÍO. CON LAS NUEVAS PÉRGOLAS PODEMOS MEJORAR SU ESTANCIA FUERA, OFRECIENDO UNA PÉRGOLA ADECUADA, TENIENDO EN CUENTA LOS DESEOS DEL CLIENTE. 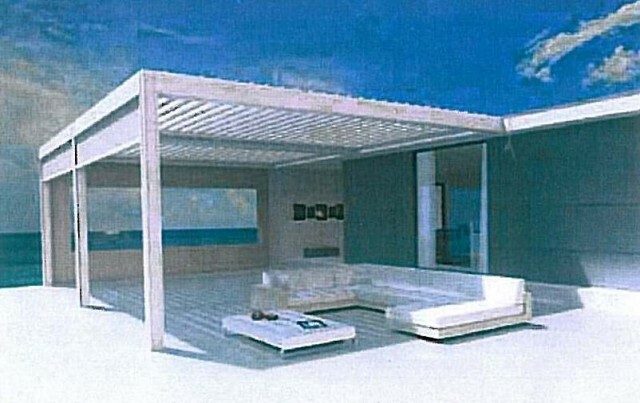 CAMARGUE: ESTRUCTURA DE ALUMINIO CON TECHO IMPERMEABLE DE LAMAS MÓVILES DE ALUMINIO CON DESAGÜES INTEGRADA, POSIBILIDAD DE INTEGRAR SCREENS RESISTENTES AL VIENTO, PANELES CORREDERAS DE VIDRIO O PANELES CORREDERAS, DIFERENTES CONFIGURACIONES DE CONSTRUCCIÓN: INDEPENDIENTE, ACOPLADO A UNA PARED O INTEGRADO EN UNA APERTURA EXISTENTE. ALGARVE: ESTRUCTURA DE ALUMINIO CON TECHO IMPERMEABLE DE LAMAS MÓVILES DE ALUMINIO, CON ROTACIÓN DE 150º. DESAGÜE INTEGRADO. DIFERENTES CONFIGURACIONES DE CONSTRUCCIÓN: INDEPENDIENTE, ACOPLADO A UNA PARED O INTEGRADO EN UNA APERTURA EXISTENTE. LAGUNE: ESTRUCTURA DE ALUMINIO CON TECHO INTEGRADO DE TEJIDO DE PROTECCIÓN SOLAR IMPERMEABLE PERO TRANSLÚCIDO. DESAGÜE INTEGRADO, CON PONSIBILIDAD DE INTEGRAS SCREENS RESISTENTES AL VIENTO, PANELES CORREDERAS DE VIDRIO O PANELES CORREDERAS.